To the beginning gardener, everything you plant in the ground that isn’t a seed or a plant with roots is thought of as a bulb of some form. This would include daffodils, crocus, iris, dahlia, onions and even potatoes.
. They are all storage organs, they may seem the same but there are differences that we need to understand to get the best from them. Put them in the ground, and later, a plant appears. You can lift them, store them and reuse the following season. The wonderful thing is, they grow again into the same variety as their parents because they are genetically identical. It is a good idea to handle and look at them closely to understand their differences. 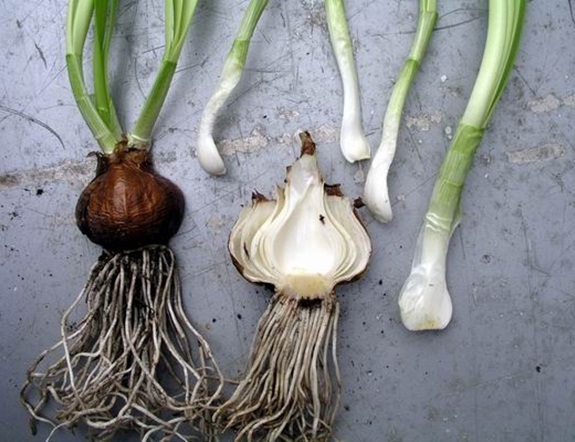 Bulbs are formed from fleshy leaf scales attached to a base which is really a stem with roots attached. The leaves are swollen with food energy to give the new plant a start until it is able to make energy for itself. The outer scales are often dry and protect the inner layers. In the middle, growing from the base, is a flowering shoot surrounded by leaves which emerges when the bulb develops. Daffodils, tulips, onions and garlic, all grow from bulbs. Narcissus bulb showing the base, which is the stem. The scales are leaves acting as a food store. The shoot grows from the centre. Corms are often confused with bulbs because they appear to be the same from the outside. They are the swollen underground stem forming a storage organ that allows the plant to survive hostile conditions, which may be dry summers or cold winters. When one is cut, the inside is solid and not made up of layers. On the top, buds grow into shoots, producing leaves and flowers. At the base, corms form cormules, used to propagate new plants and may take a year or two to flower. Some corms, gladioli in particular, develop a new corm for the following season at the top of the old one as it flowers. Roots develop from the new corm which pulls it deeper into the soil. Crocus, freesia and some irises grow from corms. 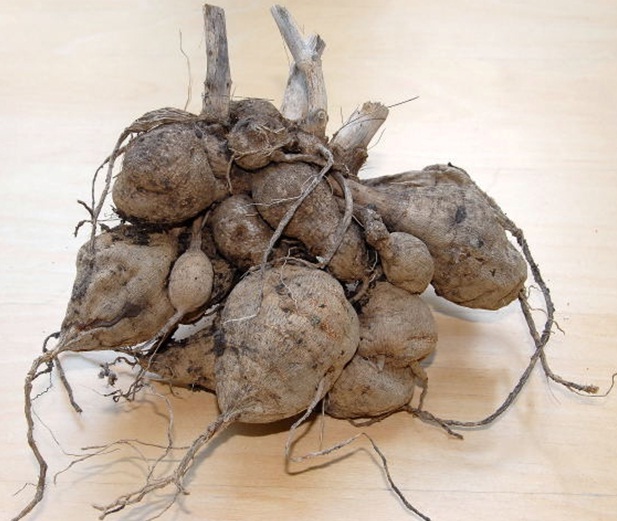 Plants with swollen stems or roots used for food storage are referred to as tubers. Like corms, they are used to provide a store of energy for regrowth after a cold or drought period and as a means of reproduction. Stem tubers, like potatoes, have all the parts of a plant stem. The ‘eyes’ produce shoots that grow into stems and leaves from the upper end. The terminal bud is at the very top. The roots grow from the lower end. Next time, look at seed potatoes when they have been placed in a tray to sprout before planting and carefully dig up a haulm when harvesting. 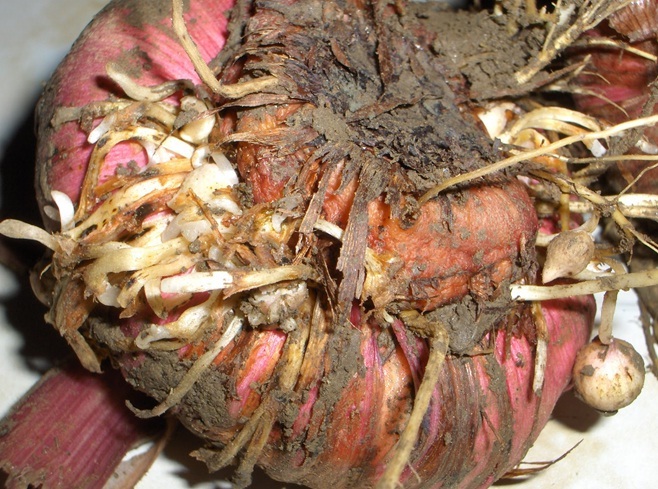 New tubers form at the end of the parent tuber and the old tuber dies and decomposes. The parent tubers or ‘seed potatoes’ are planted, shoots and roots develop, more tubers are produced and the parent tuber rots away. 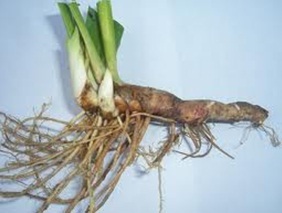 Root tubers are modified roots, one end is attached to the old plant and produces buds which grow into stems and leaves and the other produces roots. Through the growing season, new tubers grow and at the end, the shoots die, leaving the newly grown roots to grow the next season. Dahlias are a good example. Rhizomes are swollen, usually horizontal underground stems that sends out roots and shoots from its nodes. If the rhizome of an iris, asparagus or lily of the valley, is broken up into pieces, each piece will grow into a new plant. Couch grass rhizomes must be carefully removed from the soil when weeding to avoid regrowth.